While it’s unfortunate LifeSpan treadmills don’t get the proper attention they deserve, we’ll try to right this injustice now. There are hundreds of makes and models of cardio exercise machines out there and LifeSpan tends to get overlooked. Well, not around here they won’t! Not only are LifeSpan treadmills a great value for the money, but they also target the compact treadmill niche that other manufacturers tend to treat as an afterthought. There are lots of folding treadmills that “save space” when they are put away, but what about when it’s in use? What if you don’t want a monster machine sprawled out across your home gym floor or family room? Lifespan offers the smallest unit on the market; they’ve invented a treadmill with a motor mounted under the belt to make it 14" shorter than their other units with the same 56" tread belt. Imagine that. 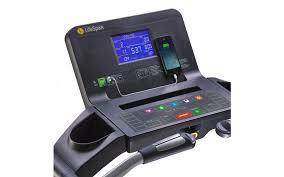 Under the hood, Lifespan engineers pulled out all the stops and put in some of the best components found in treadmills. Some of the things you’ll find include incredible cushioning and shock absorption, solid frames with wraparound handlebars, safety features, basic and no frills cardio workouts, and long warranties. The current residential model lineup consists of the TR1200i, TR2000e, TR3000e, TR3000i, TR4000i and TR5500i, ranging in price from $799 for the popular, entry level Lifespan TR1200i to $1,699 for the top of the line TR5500i model. Keep in mind that all of the LifeSpan treadmills fold. Models with an "e" designation can be folded electronically with the touch of a button. The "i" treadmills must be folded manually. The TR2000e is a slight step up from the base TR1200i, with a heavier incline motor, more compression shocks, better parts warranty and an enhanced 6" blue backlit display with optional Bluetooth workout tracking, media holder and dual purpose USB port. The TR3000e is very similar to the TR2000e, but features a stronger 2.75 CHP motor and a maximum user weight of 400 lbs. The TR3000i is the same as the TR3000e, except with manual folding. This one is a big step up from the rest of series, with a stronger 3.25 CHP motor, speeds up to 12 mph and a longer 20" x 60" deck that can accommodate taller users. Otherwise it shares many of the same features and capabilities as the TR3000 series. The LifeSpan TR5500i is considered the top of the line residential model, with a powerful 4.0 CHP motor, all steel frame, large 22" x 60" deck, a whopping 43 built in workout programs, 13 levels of incline, 2 decline levels and a top speed of 13.5 mph as opposed to 12 on all of the others. There are two heavy duty models as well that you might want to consider if there will be a lot of users and you think the treadmill will see a ton of heavy use. 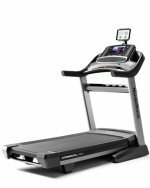 The TR6000i is a light commercial treadmill that costs around $2,200 on sale, and the TR7000i is a commercial machine that costs around $3,000 on sale. 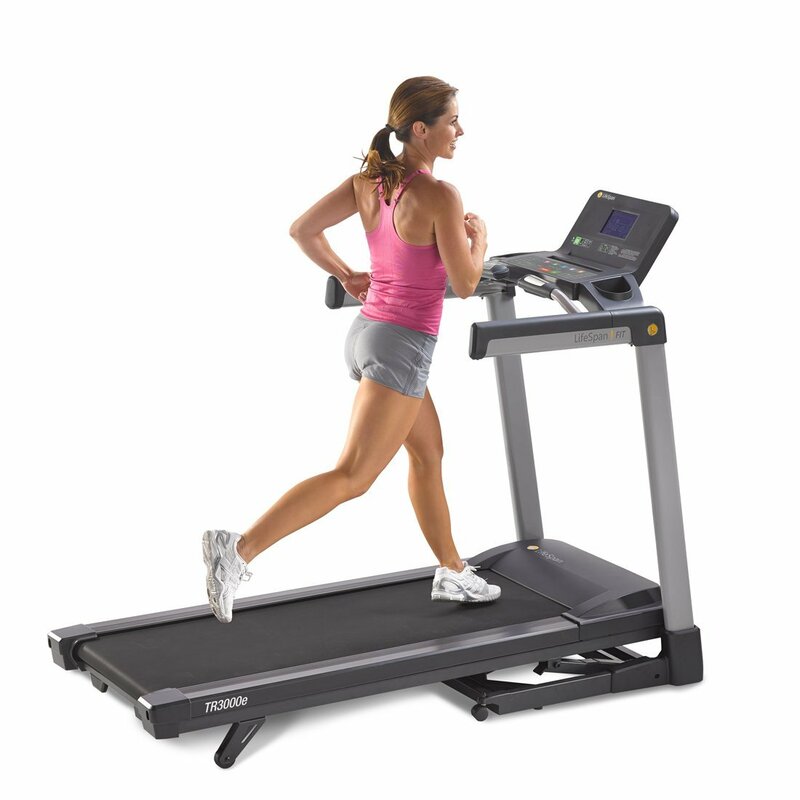 On all LifeSpan treadmills, the belt is pulled over large high-quality rollers, and the machine’s quiet, cool-running motor operates at low RPMs for consistent performance. Step back from the machine and you’ll notice they have an elegant profile on all the machines, no matter what the price level. Which LifeSpan Treadmill Should You Choose? For very light use, including mostly walking and perhaps a bit of jogging, the entry level LifeSpan 1200i will be just fine for your home gym. If you want the ability to track your workouts and keep tabs on how you are progressing over time, consider one the 2000 or 3000 series. For anything more than light usage, we like the TR4000i as it is a big improvement on the lower-end series. You get a much stronger motor, more speed and the longer deck can accommodate more users and give you more room to stretch out your stride. The top of the line TR5000i is definitely the most impressive LifeSpan treadmill, but you don't really need all of that unless you are a more serious athlete or you are training for a competition. However, that machine is a beast, and at only $200 more than the TR4000i it might just be worth it for what you are getting. Reviewers have always been more than impressed with the line’s solid feel and low-impact performance. Lifespan’s TR1200i machine ranks on many Best Buy lists, as does their top end TR5500i model. If you’re in the market for a good size treadmill that will somehow magically fit into a small space, or have joint troubles and are looking for one of the better cushioned decks, Lifespan treadmills may just be the niche machines you’re looking for. You can read more in-depth reviews on all of the current residential models below, with specs, prices, industry news and buying tips, along with other valuable information to help you make a more informed decision. Lifespan TR1200i - This Lifespan folding treadmill gets an astounding number of positive reviews from customers for its ergonomics, sturdy design and self-folding mechanism. A GREAT BUY if on sale for $999. Lifespan TR3000 - An attractive folding design delivered at an incredible price, with a stronger motor than the TR2000 model. Lifespan TR5500i - The new top of the line model replacing the popular TR5000i with decline capability, strong frame and over 40 workout programs. LifeSpan TR1200-DT5 - The most popular desk treadmill in the lineup with adjustable height and Bluetooth technology built in.